After the go-carts, the entire department (and their sig. others) went to "Steen's" house for dinner. Steen is our supervisor, from Denmark, who is normally a very mild mannered, soft spoken guy. But, get a couple beers in him (the Danish LOVE to drink), and he is absolutely hilarious, and an entertaining guy to talk to about any subject. Also, keep in mind that our group is extremely diverse, and we have people from not only Holland, but Poland, Denmark, Germany, Georgia (the country, not the state, of course), China, India, Finland, Canada, and of course us from the US. Everyone has such a different perspective, and different opinions of other countries, so it makes for some really funny & interesting conversations. So, while we weren't sure what to expect, we had a great time that evening. Contrary to what I thought before, Europeans do have a very strong opinion about "other" countries. They have the same stereotypes of countries here as we in America may have of people from certain states in the US. It's funny to listen to them go on about this type of thing, though, because I guess I naively thought that they would be very "diplomatic" or understanding of other people or cultures. But, the truth is that people are the same no matter where you go. They are critical of people and places that are different than where they come from and what they are used to, and they want to let you know that they feel that their traditions are really the best, or make the most sense. But... I digress with all of this international dialog. Back to our great weekend. Today, we slept in (yes! ), woke up and cooked ourselves an "American" breakfast of French Toast, with a European flare (Nutella and banana's for toppings... Yum!). A little while later we went to the gym, for a quick workout, since we are now trying to burn enough calories to compensate for our intake of calories in the form of Belgium beer and chocolate. After a couple more hours of relaxing, we decide to bike over to Delfshaven to enjoy the beautiful sunny day while it lasted. 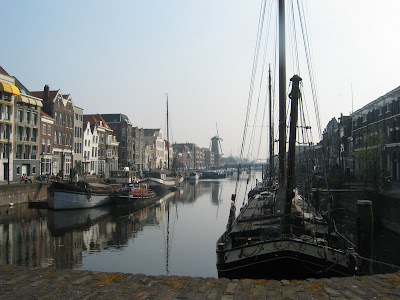 It's the quaint little historic area beside Rotterdam that I've described before, complete with canals and a wind mil. 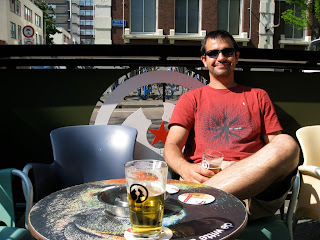 We went to our favorite Rotterdam Brewery (yes, that's right, a Rotterdam micro brew), Pelgrim, and sat outside at a table on the sidewalk and drank some coffee and beer, read our books, and soaked up the sun. This may be some of the last sunny days we have before our rainy fall/winter kicks in, so we are trying to savor it as much as possible. There are so many things that are easy to take for granted here in Europe. Such as being able to ride your bike to so many interesting places, and being able to sit outside at a cafe or restaurant. We try to remember to appreciate these things, but it so easily becomes part of your everyday routine. This is nice for us, as it is a pleasant way of life, but it also makes us wonder... what will we do when we move back to the States?